Warhammer Community have shared the details of the 3 upcoming new heroes in the new Nighthaunt release! 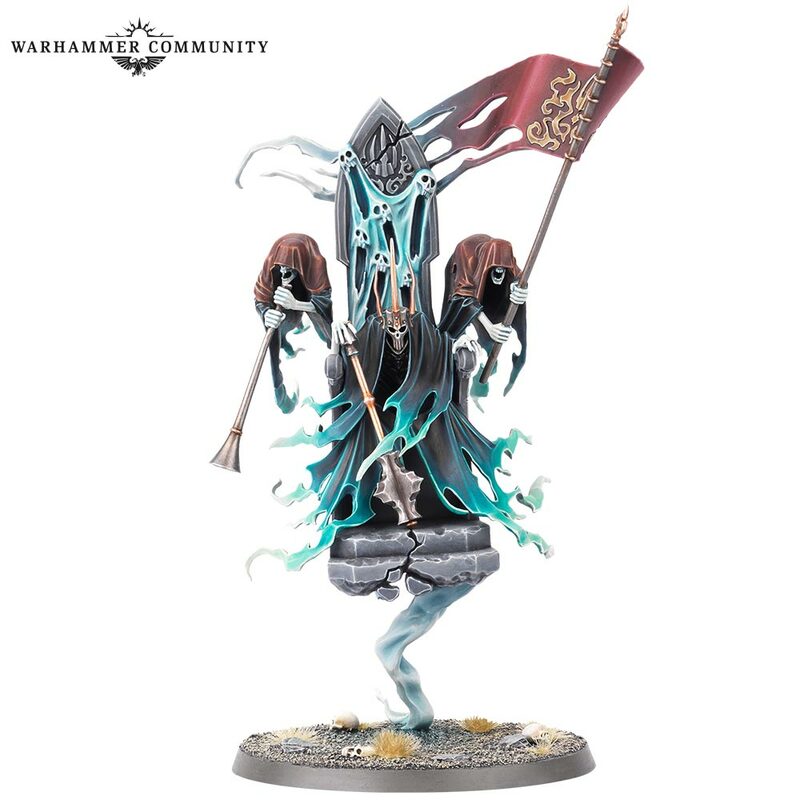 These guys are perfect to add to your Nighthaunt collection from Soul Wars! 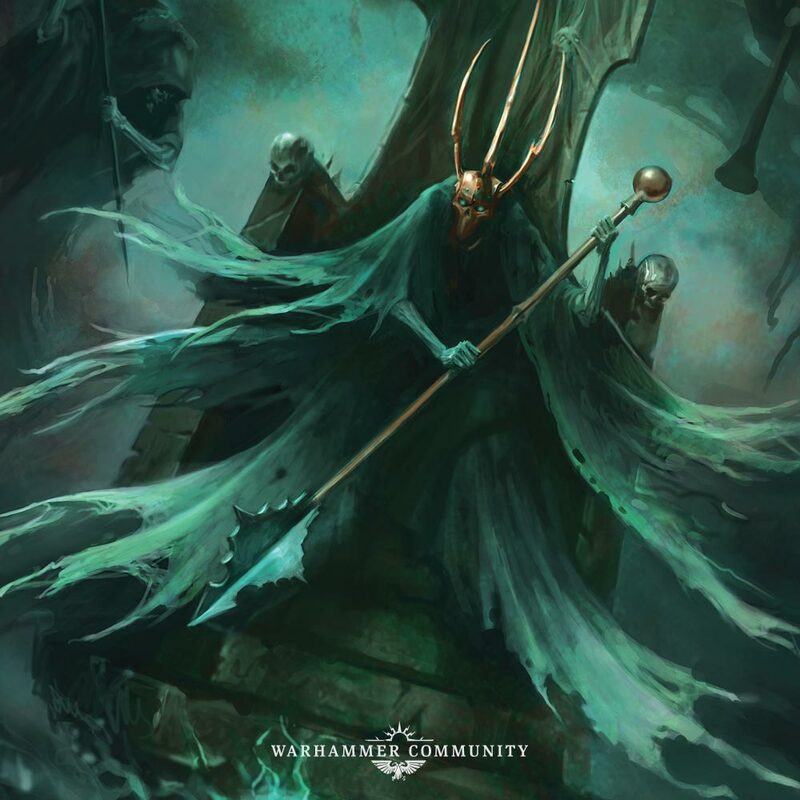 Battletome: Nighthaunt is coming – and with it, three terrifying, never-before-seen named characters from the Mortal Realms. Each of these sinister champions was once a citizen of the Mortal Realms, their souls now twisted in service to the Grand Necromancer. As Nagash prepares to conquer the Mortal Realms, we’d be very surprised if we don’t see a lot more of all three both in the lore and on the tabletop. 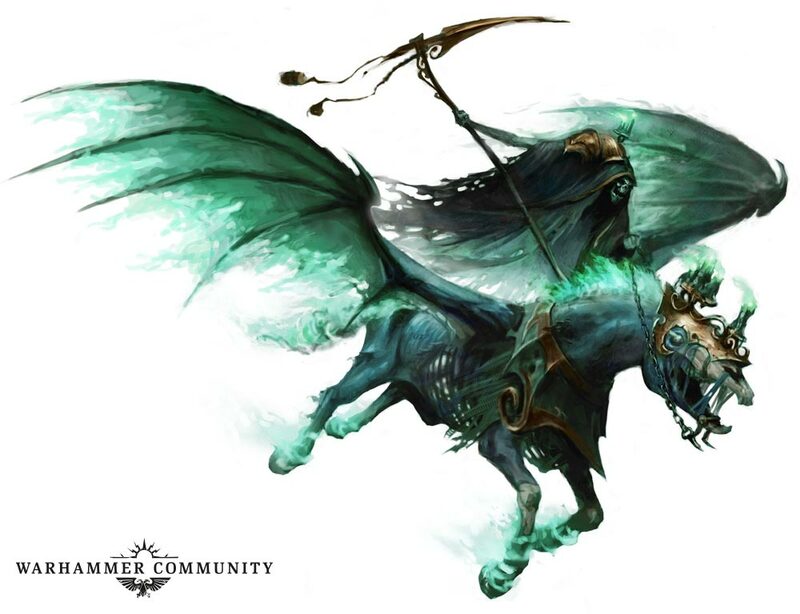 Today, we’re taking a closer look at the new Nighthaunt Heroes – and we’re checking out Reikenor the Grimhailer for the first time ever! 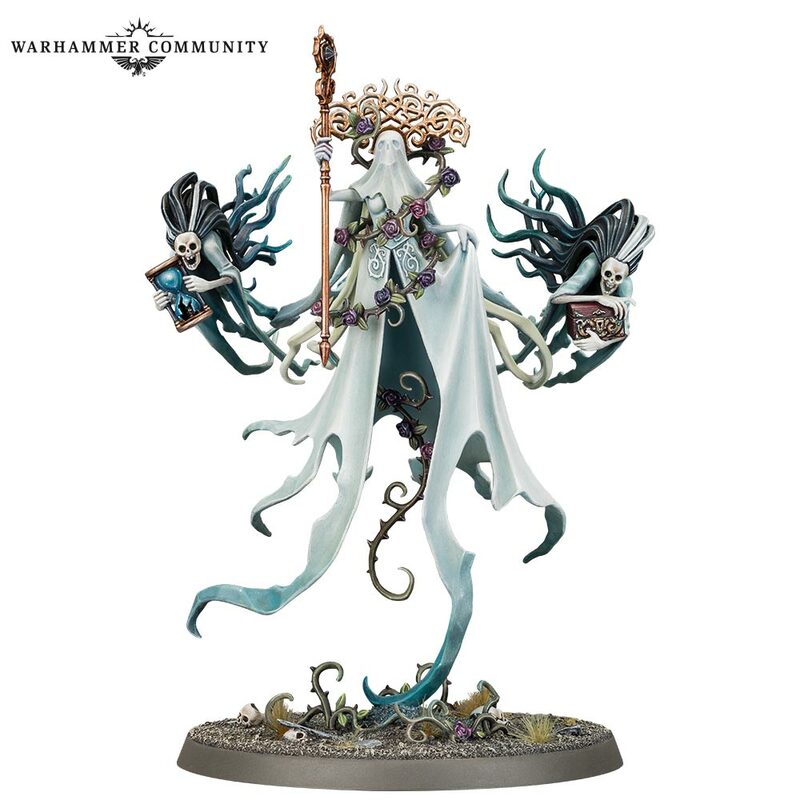 Crowned Mortarch of Grief by Nagash, it is Lady Olynder who has united the previously disparate spirits, gheists and wraiths of the Mortal Realms into a single, terrifying army. Once a usurper who tricked her way into power, she now is filled with a singular, unbearable misery that she can wield as a deadly weapon – even the bravest struggle to stand before her. Lady Olynder helps your army do what it does best – grind the enemy down through attritional warfare. You’ll win with Nighthaunt not by shattering your opponent in a single turn, but by playing the long game, using your units’ inherent resilience, not to mention abilities that sustain and heal them, to outlast your enemies. Every one of Lady Olynder’s abilities plays into this principle. 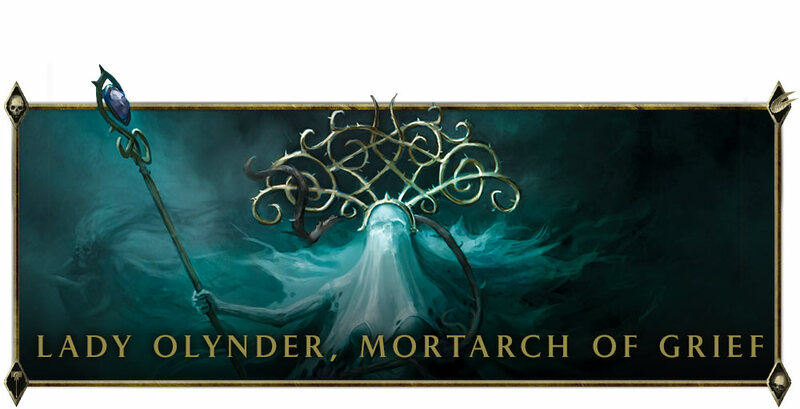 Mortarch of Grief – which means more models flee from battleshock when near Olynder – makes chipping away at hordes that much easier, while Wail of the Damned inflicts a deluge of mortal wounds on nearby units – enough to force multiple battleshock tests in a single turn. Lifting the Veil and Grave-sands of Time, meanwhile, allow you to face down particularly troublesome enemy units while lending Lady Olynder some extra sustainability. By using the No Rest For the Wicked command ability, you’ll be able to keep your units in fighting shape for longer, particularly if you’re taking hordes of durable, multiple-wound models like Hexwraiths and Spirit Hosts, while finally, the Grief-stricken spell is a great counter to any enemies that have over-invested in a single, deadly unit. When it all comes together, it’s nothing short of terrifying on the tabletop. Lady Olynder becomes a deadly nexus for your army, steadily and inexorably wearing down the foe while keeping your forces fresh and ready to fight. In life, Kurdoss Valentian was a ruthless betrayer who killed, deceived and betrayed his way to the throne – well, almost! 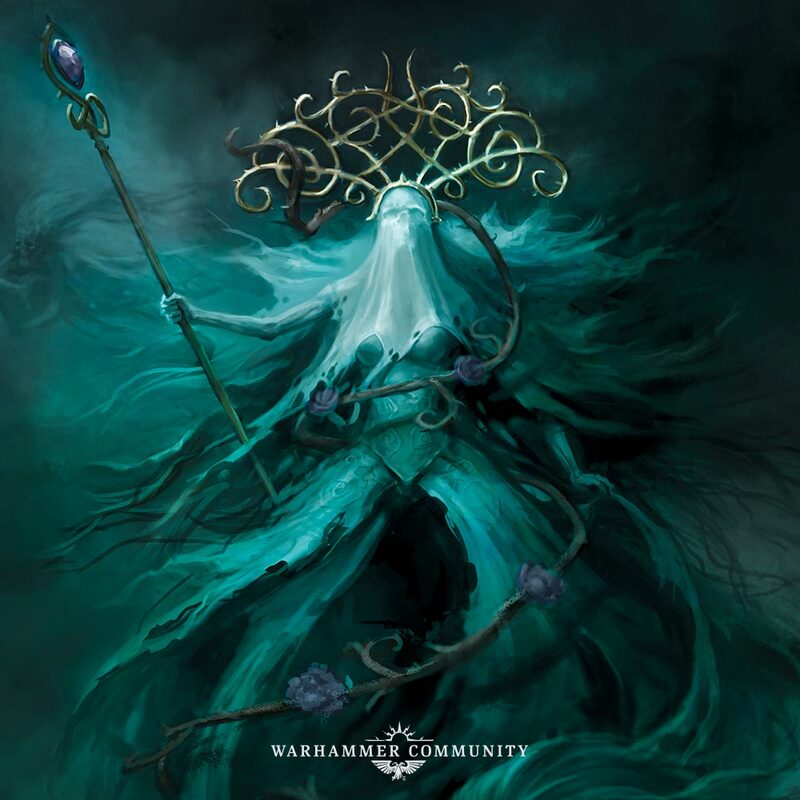 At the moment of his crowning, Nagash struck Kurdoss dead and took his soul, granting him great power yet also cursing him to never know true rulership. 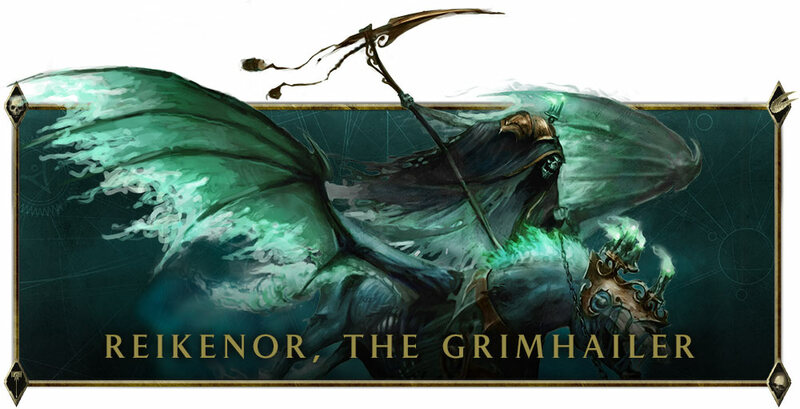 Ever betrothed to Lady Olynder, Kurdoss will never, ever, be king – his title is a cruel jest on behalf of Nagash. Even his heralds mock and goad their lord, crying his wicked deeds and defamatory titles for all to hear – appellations such as Usurper, False Lord and Craven King. Kurdoss is a bruiser in close combat, boasting 5 Attacks with an excellent Rend of -2 and D3 (or, if you’re lucky, D6) Damage each, making him a pretty scary prospect in close combat, even to the most heavily armoured foes. 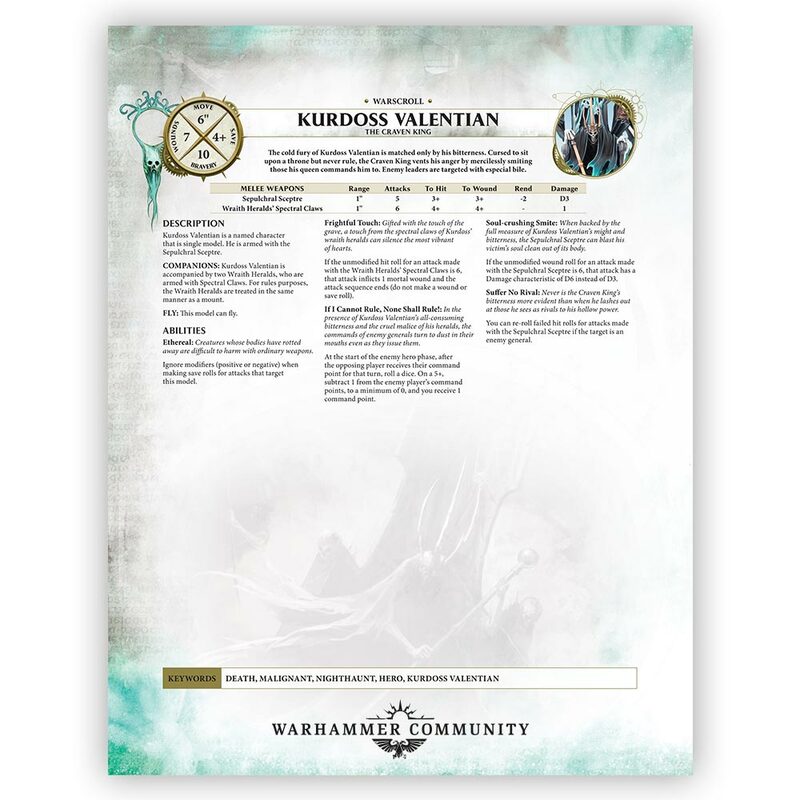 Suffer No Rival is where Kurdoss really shines, re-rolling failed hit rolls against your enemy general, making him really useful for assassinating other Heroes – and that’s before you factor in the various synergies available to Nighthaunt forces. Even when he’s not smashing apart enemy generals, Kurdoss is punishing against armies that rely on their command abilities, not only denying them one command point on a successful 5+ roll each turn, but adding the stolen point to your own tally! Kurdoss and Olynder make a great tag team, with Olynder having strong effects that last throughout the game and Kurdoss acting as a scalpel to remove the most powerful foes, while hurting your enemy’s ability to react. 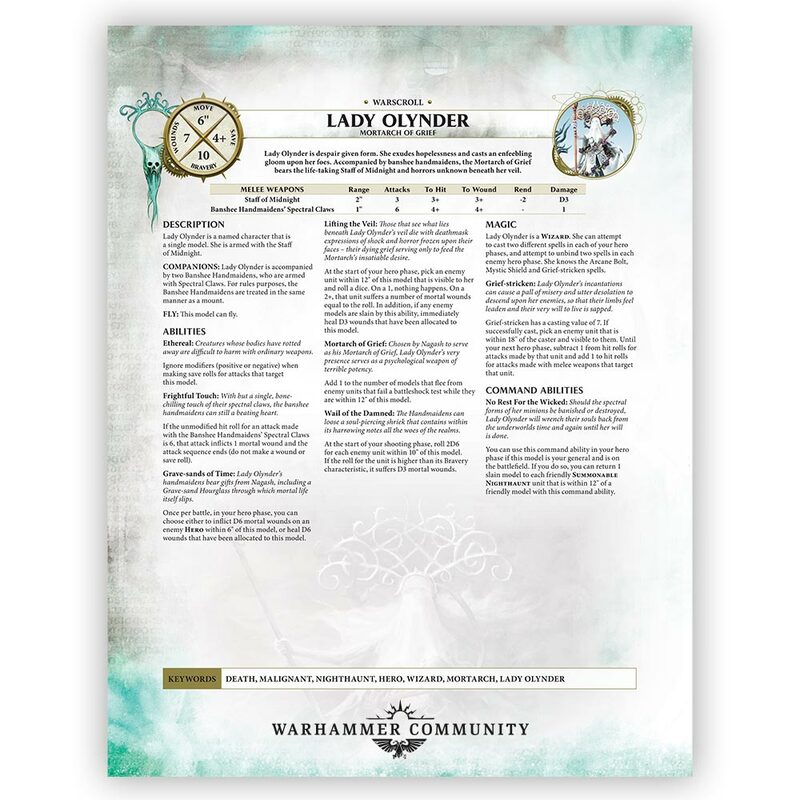 So Lady Olynder is a Wizard who specialises in supporting your army, and Kurdoss Valentian is a close-combat specialist – but what about someone that could do a bit of both? Reikenor the Grimhailer is your guy (or ghost). Reikenor really shines in the Hero phase with his Corpse Candles ability. Sometimes, you really, really need a spell to go off – maybe there’s an enemy Hero who’s just asking to be suddenly and violently acquainted with the Purple Sun of Shyish, or perhaps you’ve got a combo in mind and you don’t want it to be unbound. Corpse Candles lets you do just that – and you can even use it to harm your enemies! 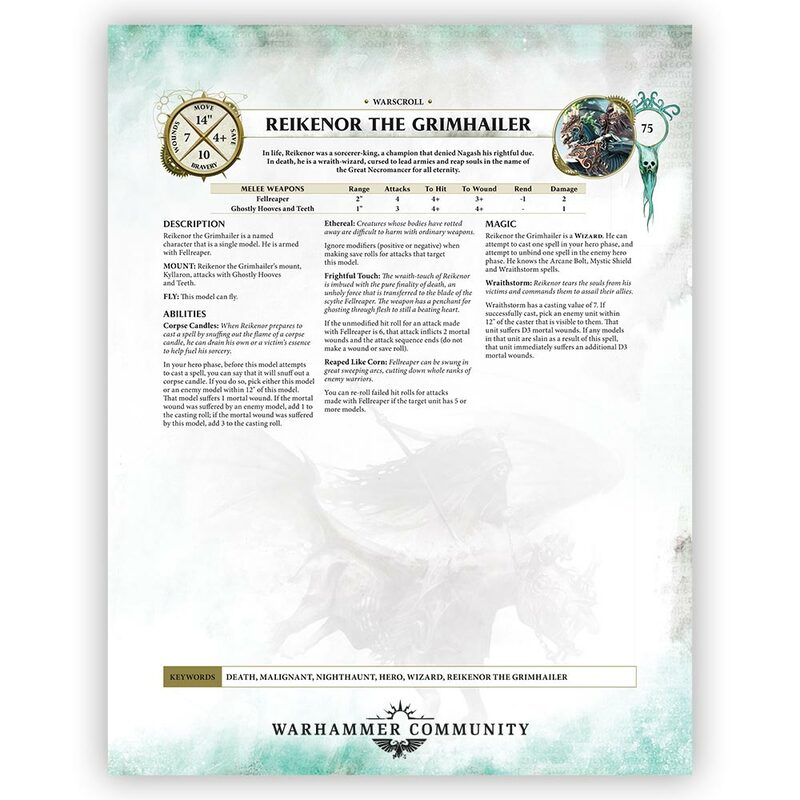 You’ll want to use Reikenor to clear out hordes, with his Reaped Like Corn ability helping him plough through larger enemy units, and Wraithstorm, a unique spell which works particularly well against units of models with a single Wound each. Lastly, Reikenor lends himself to themed Nighthaunt armies really well. 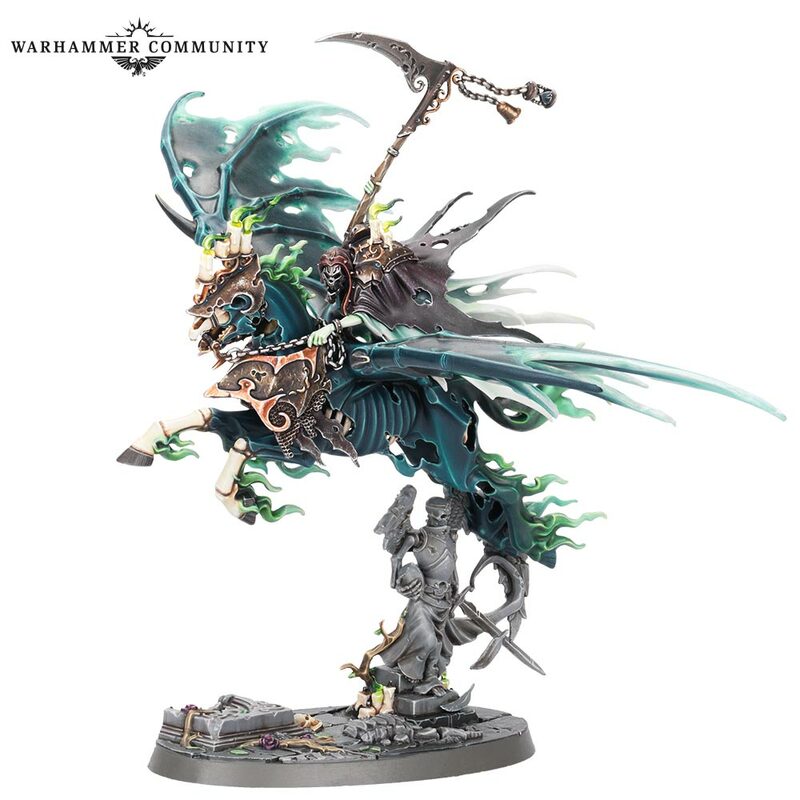 If you want to field a full force of spectral cavalry, having him lead a charging mass of Hexwraiths and Black Coaches would be a fun, distinctive and powerful force on the tabletop. You won’t have to wait too long! 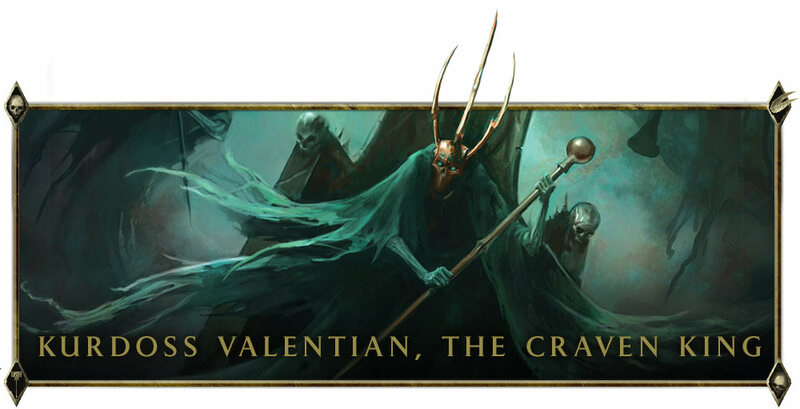 Lady Olynder and Battletome: Nighthaunt are available to pre-order this weekend, while Reikenor the Grimhailer and Kurdoss Valentian, the Craven King will be available soon after. All you’ll need is an army for them to lead – find yours in the Soul Wars boxed set, available to pre-order now.